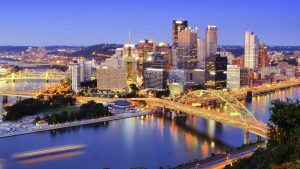 Enhance your career in Pittsburgh! TapRooT® Techniques are designed for everyone, from new learners to expert. In two days, you’ll absorb the TapRooT® Essentials to find and fix the root causes of incidents, accidents, quality problems, near-misses, operational errors, hospital sentinel events, and many other types of problems. Upon course completion, attendees will receive a certificate and a 90-day subscription to TapRooT® VI, the online software service. Best of all, you will have the advantage of professional training in your skill set and on your resume! Attendees should bring safety incidents or quality issues from their facility for a team exercise. Bring either written reports or, alternately, you may offer an incident without a written report. We’ll divide into teams of 2-4 people; each team will analyze a different problem during the course. For the 2-Day TapRooT® Root Cause Analysis Training course, we’ll congregate at the Embassy Suites Pittsburgh Downtown at 535 Smithfield Street. Enjoy the ample amenities of the hotel. When you’re rested up, take a break to enjoy your host city. Cross a piece of history as you travel above the Monongahela River via the Hot Metal Bridge, a truss bridge that’s part of America’s steel-making heritage during WWII. You can hike or bike the Great Allegheny Passage trail that crosses this bridge in the approach to Pittsburgh’s Golden Triangle area. Hey, in the Steel City, with 446 bridges, you have to cross one! If you’re a history/architecture buff, check out the Laurel Highlands mountain region where you can tour Fallingwater, the famed Frank Lloyd Wright house. Back in Pittsburgh proper, you can relish beautiful Victorian homes in the tree-lined East End, stately row houses on the North Side, and over 80 bars in the Southside. Venture to Lawrenceville for its art galleries and hipsters, and Oakland is the college town and home of the University of Pittsburgh and Carnegie Mellon, plus scads of museums, green spaces, and ethnic restaurants. Use our Pittsburgh Pinterest board to help you plan. Don’t forget to register here for a career-changing experience.